In our second installment of The Hack’s Toolbox, we will explore one of the most fundamental tools utilized by the hack filmmaker, the obligatory scene featuring people fleeing from an explosion in slow motion. Everybody has seen this scene at least a thousand times, with about five hundred of the scenes featuring a juiced-up Nicholas Cage running in slow motion from an explosion in films directed by people like Michael Bay or Simon West. These run-from-explosion scenes are considered to be complete hackery today because overuse by hack directors has robbed all dramatic impact from these scenes. We have all been conditioned by Hollywood to know that nobody actually ever gets caught in an explosion, especially when time slows down on screen. Due to this frequent overuse, if a director wants to stand out from the rest of the hack pack, he must do something truly special to ratchet the hackery up to epic proportions when directing such a scene. To do so, one must be a hack willing to demonstrate off-the-chart overindulgence, shamelessness and a complete lack of style. In a world filled with people like Bay, West, Brett Ratner and McG, only one man has reached this level and his name is John Woo. Those who remember movies like The Killer and Hard-Boiled are probably extremely offended that I have just placed the once-respected Woo on such an ignominious level of hackery, but when a filmmaker completely sells out and becomes a parody of his former self, as Woo has during the Hollywood stage of his career, that filmmaker must be placed in the company of hacks such as the ones mentioned above. It is very difficult to top placing a kitchen timer on a nuclear bomb, as Woo did in Broken Arrow, but Woo reached the pinnacle of hackdom with one truly remarkable scene in his 1993 Hollywood directorial debut film Hard Target. Not content to merely show the ubiquitous Lance Henriksen or the star of the film, Jean-Claude Van Damme, running in slow motion away from an explosion, Woo reached a new level by having Wilford Brimley (yeah that Wilford Brimley from the Quaker Oats commercials) ride a horse away from an explosion in classic John Woo slow motion style. Think about it. Explosion. Slow motion. Horseback. And Wilford Brimley. If you’ve never seen this movie, you really need to check out the video clip below. Mr. Bay, I’d like to see you top this. Wow, I had almost forgotten about how bad Hard Target really was… call it wishful thinking for Woo’s US career. He did much better with M:I-2, but he still insisted on those damn doves and that mano-a-mano finale on the beach. Ok, maybe he didn’t do that much better. I have to disagree with you on this one, haksnider. wilford brimley on a horse riding away from an explosion, in slow motion, and bow-in-hand, demonstrates an abundance of style! Lithium97, you love Wilford Brimley and this article was dedicated to you. 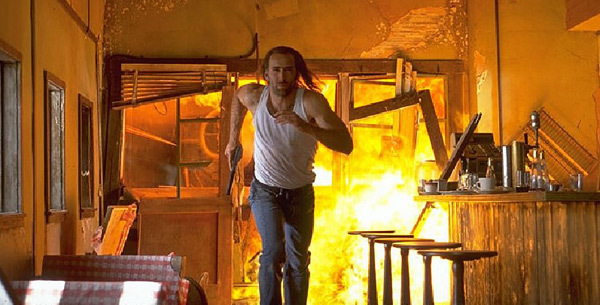 First of all, I just added Con Air to my queue. How did I let that slip by?? Oh goody, goody, goody…can’t wait!! Let’s not forget Woo’s penchant for the slow-mo jumping, twisting thru the air while shooting two guns move. He heh, classic.